Now that we're a few weeks into the new fall TV season, I thought I'd start focusing on some of the newer shows we've tried. As I've mentioned here before, my husband and I usually watch two TV shows together each evening - that's our together time, and there are lots of shows we enjoy together. Our 21-year old son lives at college (about 20 min away), but each season, there are a couple of TV shows that he wants us to save and watch with him when he comes home on Sundays. One of those is the new NBC thriller, Blindspot. 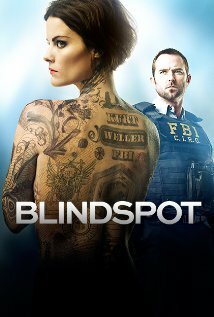 Blindspot has a unique central plot: the first episode opens with a woman found in Times Square, naked and with no memory...and covered head to toe in mysterious tattoos. The FBI brings the Jane Doe, played by Jaimie Alexander (she was in both Thor movies), back to their field office and lab. One of her tattoos - placed prominently on her back - is the name of an FBI agent, so they call him in. Agent Kurt Weller, played by Sullivan Stapleton, doesn't recognize the woman, but he is intrigued by the mystery and especially why he was specifically called out. From then on, the FBI agents, led by Weller, investigate her tattoos one at a time, aided by Agent Patterson in the lab, played by Ashley Johnson (whom I recognized from her roles as a child in Growing Pains and Phenom). For instance, they notice a date hidden in one of the tattoos that is that very day, so they focus on that one immediately. None of the tattoos are straight-forward - they are each unique and coded in some way. After a few episodes, you begin to see that each tattoo leads them to some sort of crime about to take place, but none of the crimes seem to be connected in any way. With each episode focusing on a different crime, the show unfolds in some ways like your typical crime show, with the detectives/investigators trying to figure out the crime and catch the bad guys. But, woven throughout are the mysterious tattoos and Jane's and Weller's quest to figure out who she is, where she came from, and who did this to her (and why). She does begin to get flashes of memory here and there, but they don't make much sense at first. We have watched three episodes of Blindspot so far and are hooked! The long-term mysteries plus the new investigations each episode make it a compelling, action-packed show with plenty of suspense and intriguing characters. Five episodes of Blindspot have aired so far, and all of them are still available On Demand and on the NBC website (though the first is scheduled to come off Demand in about a week). Episodes are $1.99 each on Amazon Prime and are also available on Netflix. What new fall shows are you enjoying? I wonder if I can squeeze more tv series into our tv schedule haha... I sure would fancy that one! I love the tattoo idea- mysterious! I'm behind with almost every tv series I fancy, but I'm getting there. The walking dead, Eye Candy,Nashville and Homeland are top 4 at the moment. ha ha - it's the same with us, Mila - we hear about so many good shows but our viewing schedule is full! My son LOVES The Walking Dead. Saturday Snapshot 10/31 - Happy Halloween! It's Monday 10/26! What Are You Reading? It's Monday 10/19! What Are You Reading? It's Monday 10/12! What Are You Reading? It's Monday 10/5! What Are You Reading?